Notes From the Road: Sympathy for George (HW) Bush edition. Remember that moment in the campaign sixteen years ago when Bush the father was confronted by a barcode reader in a supermarket and wondered what it was? He was widely ridiculed, by me too, for what was seen as upper-class cluelessness. Mere retail, it seemed, was for hoi polloi, not for those blessed by generations of privilege. Well, I find myself a little more empathetic for the old spook now. On the first leg of my current vacation, I had occasion to visit a vast Target store on the edge of the San Francisco bay. Part of my reaction was like that of an Eastern European venturing west in the first weeks after the Wall came down. So much stuff they have in one place, comrade! But what made me feel truly like a peasant from the hills was my first sight of what I understand to be commonplace: an escalator for shopping carts running between those moving stairs for people. According to this Youtube, I’m at least a year behind the times in being gobsmacked by this next step in massive retail. Which leads to my very brief flash of a sense of kinship with Bush senior. This stuff can sneak up on you. It remains kind of bizarre that he had somehow missed the bar code reader. But I can see how a President would never actually come that close to a cash register for much or all of his term — and a lot can change in four years. What this means today: well the tech-positive candidate is clearly Obama. McCain — he’s the one who doesn’t use a computer. I don’t think this will be determinative, but the election could be moved at least a bit by the relative proportions of those in the electorate for whom shopping cart escalators are strange and those for whom they are part of the furniture. My guess is that the balance has tipped towards those for whom tech, and more importantly tech-change is the norm. But my guess and a buck seventy five gets you on the subway, so take that for what it’s actually worth. Consider this an example of a vacation-level post. 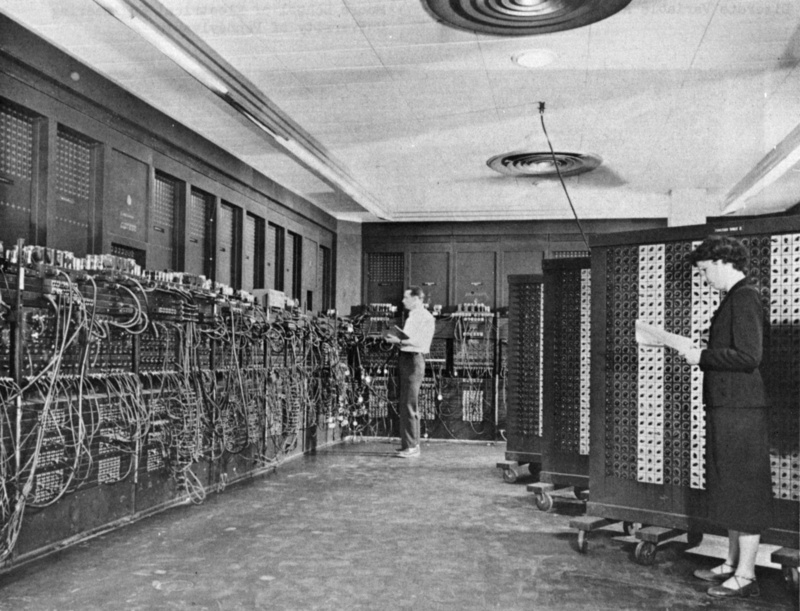 Image: Eniac Computer, Philadelphia. Image taken between 1947 and 1955. US Army photo. Source: Wikimedia Commons. This entry was posted on June 22, 2008 at 1:35 pm and is filed under McCain, navel gazing, Obama, Politics, Technology. You can subscribe via RSS 2.0 feed to this post's comments. The first time that I saw a shopping cart escalator, in Florida on vacation four years ago, I too was quite surprised. I have yet to see one in the Midwest where there is enough space that shopping markets don’t need to be two floors. I think of it as being less of a technology trend but rather a space crunch. Did you see Hillary Clinton trying to fill up a gas tank during the IN primary? And trying to work a coffee machine at the convenience store? Same sort of thing, she even commented that the secret service normally did that sort of thing for her. Vacation from blogging? You are so old-fashioned. Saw one of these in Milwaukee at Whole Foods. It was only a down as I recall. But needed to get from the store to the parking garage – don’t know how they got the carts back up? Probably there was an up. I saw this more than a year ago and that was the first. Of course, there have been mechanisms for taking those lugage carts up and down escalators in airports for much longer.